Thank you for choosing Tattumi . We hope you enjoy our products – we believe in happy customers and aim to provide the very best service and products possible within our gift as a company. By purchasing our products, you agree to the following terms. Please read this information before using the Tattumi.co.uk or any of its products. Standard orders are despatched first clads by standard post, from which point they become the responsibility of the customer and the postal provider. All delivery times are working/business day estimates as provided by Royal Mail. Tattumi cannot take responsibility for delayed post but we do endeavour to ship every order 48hrs. Due to the nature of the product Tattumi is unable to issue refunds, please be careful and follow our application instructions closely when applying our transfer tattoos. Unless wholesale; a customer is entitled (within 28 days) after receipt of the product to dissolve the agreement without notification of reason and to return the product in the original, unopened and undamaged package on own expenses to Tattumi, 8 Ladybower Drive, Hathersage, Derbyshire, S32 1DR. Prior notice by to orders@tattumi.co.uk will be required/ Refunds will only be issued upon receipt of the entire product in its original, unopened and undamaged state. 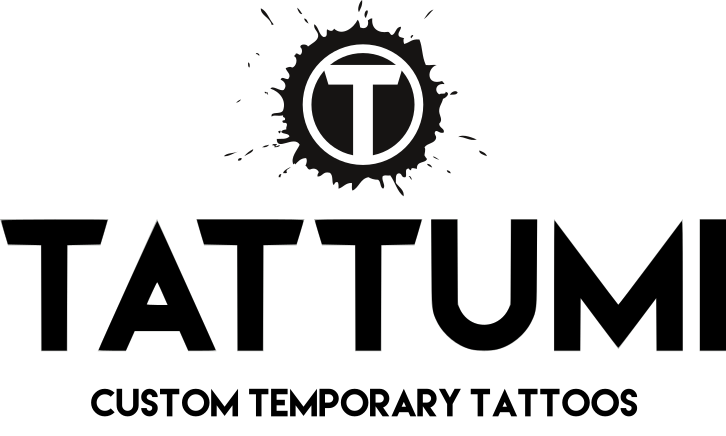 Tattumi claims no intellectual property rights for the images sent to us or directly uploaded to the website by our customers. By emailing, or uploading images our customers testify that they are the rightful copyright or trademark owner of said images or that they have full permission of the copyight/trademark owner to use said images for reproduction and/or resale or that the images emailed to us are in the public domain or are otherwise free of intellectual property protection. Tattumi reserves the right to refuse to produce any custom orders on the grounds of contravention the Prohibited Content policy outlined below. A statement by you that you have a good faith belief that the disputed use is not authorised by the copyright or intellectual property owner, its agent, or the law. A statement by you, made under penalty of perjury, that the above information in your notice is accurate and that you are the copyright or intellectual property owner or authorised reresetative. “Content” includes any text, message, data, photograph, image, graphic, information, audio/video files or other material on the Website and the related trademarks, service marks, logos, insignias and other intellectual property contained therein. Tattumi grants you a limited, revocable, non-transferable license only to make personal use of the website under the domain tattumi.co.uk. You may not: (a) make any resale or commercial use of the Website or its Content; (b) make any derivative use of the Website or its Content; (c) use any data mining, robots, or similar data gathering and extraction methods within the Website, or (d) copy, reproduce, republish, upload, post, transmit, or distribute in any way any materials or products found on the Website without the Tattumi’s prior written permission or as expressly permitted. You do not acquire any ownership or license rights over any such Content by downloading or, otherwise, using it. You may display and, subject to any expressly stated restrictions or limitations relating to specific material, download portions of the Content from the different areas of the Website solely for your own non-commercial use. All Website design, text, graphics, and the selection and arrangement thereof, are owned or licensed by the Tattumi. By displaying or publishing (“posting”) any content on or through Tattumi.co.uk or directly onto its company page/profiles on 3rd Party and Social Media websites, you hereby grant to Tattumi an exclusive, irrevocable, royalty-free, sub-licensable, worldwide, and perpetual license to use, modify, delete from, add to, publicly perform, publicly display, reproduce, create derivative works of, and distribute any such User Content in any media formats and through any media channels now known or hereafter devised. You represent and warrant that the posting of your User Content on or through the Site or other media does not violate the privacy rights, publicity rights, copyrights, contract rights or any other rights of any person or entity, and does not include any “Prohibited Content” as defined below. Tattumi assumes no responsibility or liability arising from the User Content included in any transmissions or for any error, inaccuracy, that is contained in any User Content transmitted to our Site. “Prohibited Content” includes, but is not limited to, any User Content that: (a) is defamatory, abusive, harassing, threatening, or an invasion of a right of privacy of another person; (b) is bigoted, hateful, or racially or otherwise offensive; (c) is violent, vulgar, obscene, pornographic or otherwise sexually explicit; (d) is harmful or can reasonably be expected to be harmful to any person or entity; (e) is illegal or encourages or advocates illegal activity or the discussion of illegal activities with the intent to commit them; (f) infringes or violates any right of a third party including right of privacy, right of publicity, copyright, patent, trademark, trade secret or other proprietary or contractual rights; (g) is commercial, business-related or advertises or offers to sell any products or services, whether or not for profit; (h) contains a virus or other harmful component, or otherwise tampers with, impairs or damages the Website or any connected network, or otherwise interferes with any person or entity’s use or enjoyment of the Website; (i) does not generally pertain to the designated topic or theme of the relevant Public Forum or blog; (j) violates any specific restrictions applicable to the Public Forum or blog; or (k) is antisocial, disruptive, or destructive, including “spamming,” “flooding,” and “trolling” as those terms are commonly understood and used on the Internet. Tattumi is in no manner responsible for the contents of any such linked site or any link contained within a linked site, including any changes or updates to such sites or updates to such sites. Inclusion of linked content does not imply or express affiliation, endorsement or sponsorship with any third party. Tattumi is not responsible for any loss or damage of any sort you may incur from your use of any third party website. You acknowledge that the Company may establish limits concerning your use of the Website and its services and products and reserves the right at any time to modify or discontinue your access to the Website (or any part thereof) with or without notice, including but not limited to the materials, videos, functionality or hours of availability, or the equipment needed for its access or use. You agree to pay all charges to your account, including applicable taxes, in accordance with billing terms in effect at the time a purchase is made. We reserve the right to institute new fees or charges effective upon notice on the Website. When prompted to do so, you must provide us with valid credit card information. If payments that cannot be charged to your credit card are returned to us for any reason, we reserve the right either to suspend or terminate your order, thereby terminating all further obligations by the Company. We may from time to time offer participation in promotional offers, contests and sweepstakes on our Website. Your participation in these offers, contests and sweepstakes is governed by the express rules applicable to each such offer, contest or sweepstakes. Tattumi aims to provide a top quality services and for all customers to be delighted with our products. We seek to address and resolve any concerns actively positively. The Site Terms constitute the entire agreement between you and the Company and govern your use of the Website and its services and products, superseding any prior agreements between you and the Company.